Structural equation models -- TETRAD: A standalone program for creating, simulating data from, estimating, testing, predicting with, and searching for causal/statistical models, with a nice graphical interface. Causal feature selection -- Causal explorer: A causal probabilistic network learning toolkit for Matlab (R). This package supports "local" causal discovery algorithms, efficient to discover the causal structure around a target variable, even for a large number of variables. Cause-effect pairs -- Winners of the cause-effect pair challenge. 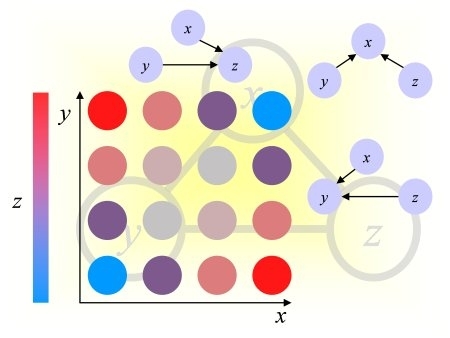 The techniques used in the challenge apply machine learning ensemble methods based on earlier work of the Max Planck Tuebingen group to detect causal relationships from pairs of variables (no time series). For time series, see network reconstruction. GLOP: A Matlab (R) package providing models included in the Virtual Lab of the Causality Workbench. Partially based on the Bayes Net Toolbox. Scikit-learn: A machine learnign package in Python, very widely used. It is complemented by Keras for deep learning. Tensor flow: The open source library of Google for network-based machine learnign applications. Azure ML: Microsoft's paying service to run machine learnign algorithms on Azure, based on graphical flowcharts. Weka: A standalone data mining environment written in Java. R: A software environment for statistical computing including many machine learning algorithms, with a lot of machine learning packages. Challenge Learning Object Package (CLOP): An object-oriented Matlab(R) library of machine learning algorithms having performed well in past challenges, including ridge regression, SVMs, boosting, and random forests. It provides an interface to Weka and R.
Kernel methods: The kernel machines website provides a list of software for kernel methods, including SVMs. The GKM toolbox provides tools for building generalized kernel machines. Software Packages for Machine Learning: A list of machine learning software maintained by David Aha. Commercial packages are found on the KDnuggets website.